Keeping your blog posts up-to-date makes your readers trust you. Such updates will also bring you more traffic and subscriptions. Learn how. This morning I published an article on how quality of content is increasingly becoming more and more important for search engines. If you’ve a few good quality posts then trust me, you’ll be better off than someone who keeps on piling not-so-good-stuff in his blog. It is very important to focus on good quality content. And this is the gist of this present post. As you must have experienced as a blogger that some of your posts are more popular than other. Every blog has a gradation of popularity among its posts. It is very important that you don’t forget them and take care of your more popular posts. Have You Forgotten Your Old Posts? Most of the bloggers simple forget about their posts that they have already published. They think that these posts are now online and will remain relevant forever. But such an approach may be harmful because information, facts, knowledge etc. are dynamic in nature. Things keep on changing in this world. What you wrote one year ago may no longer be correct or relevant today! And when a reader arrives on such a post -she immediately leaves without getting impressed or becoming your regular reader. 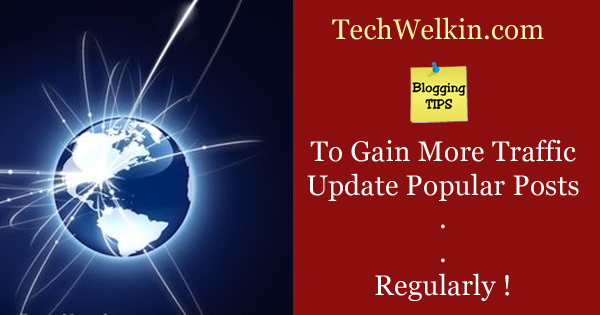 Keep on updating popular posts is a must. Which Blog Posts Become Outdated? If you blog about factual, historical stuff or current affairs; it is less likely that your posts will become outdated. Past gets frozen like ice. It changes only if some new information comes to light -but probability of such events is relatively much less. Technology, on the other hand, is a fast changing field. If you’re a tech blogger, you need to work towards keeping your old posts up to date. For example, if you wrote a Facebook tutorial two years ago, in all certainty it would require an update now because Facebook has changed its interface as well as several functions. You’re the best judge on which of your posts need an update. My point is that you should not forget old posts and make relevant changes in them as required. I know, it is difficult to go through all the posts to see if they need an update. Most of you would even forget what all you have already written about. Why It Is Important to Update Posts (Especially Popular Posts)? It is obvious that the availability of correct content on your blog makes your readers feel confident about you and your blog. They begin to trust you as an expert in your niche. And this trust brings them back to your blog regularly. They also tend to subscribe to blog RSS feed. Updated information may also be seen as better in the eyes of search engines as you would add more and updated keywords while updating your posts. This may translate into higher ranking of your posts. Thus you will gain even more traffic by the way of search engines. You should encourage your readers to point-out inaccuracies in your posts. And, needless to say, you should write only after doing proper research. Be factual and use correct language in blogging. Your article is ver useful . If one is careful enough about one’s writing then others will care about his writing .